Last week Rep Luis Gutierrez (D-Il) launched a vicious ad hominem attack on White House Chief of Staff Marine Corps General (Ret.) John Kelly. 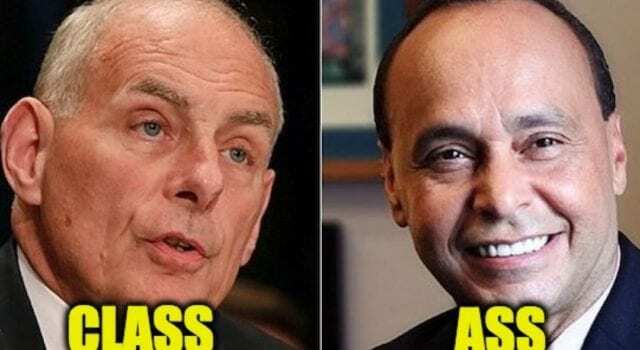 General Kelly has fired back showing more class than Gutierrez deserves. In an email to Fox News, Kelly responded to the Congressman’s attack by saying Congress did “nothing” to help so-called Dreamers when they had the chance. (…) “Every DOJ and DHS lawyer says DACA is unconstitutional. Every other legal scholar – right and left – says the same thing. Trump didn’t end DACA, the law did. That said, I worked and succeeded to give the congress another six months to do something. I am not confident,” he said. Gutierrez’s outburst displays the fact that he has absolutely no conception of honor. John Kelly served with distinction over 35 years in the Marines seeing action in both Iraq wars. His Marine assignments included commanding Marines in the invasion of Iraq and in two bloody operational tours fighting al Qaeda in Iraq’s Anbar province, and after he returned to the U.S., as chief military assistant to the Secretary of Defense. Next articleSharpton’s in trouble and cant scream “Racism”!